Redwork is the art of embroidery using only one color: red. I used to think the idea was quite boring, as I tend to like selecting color families that work together in a project. 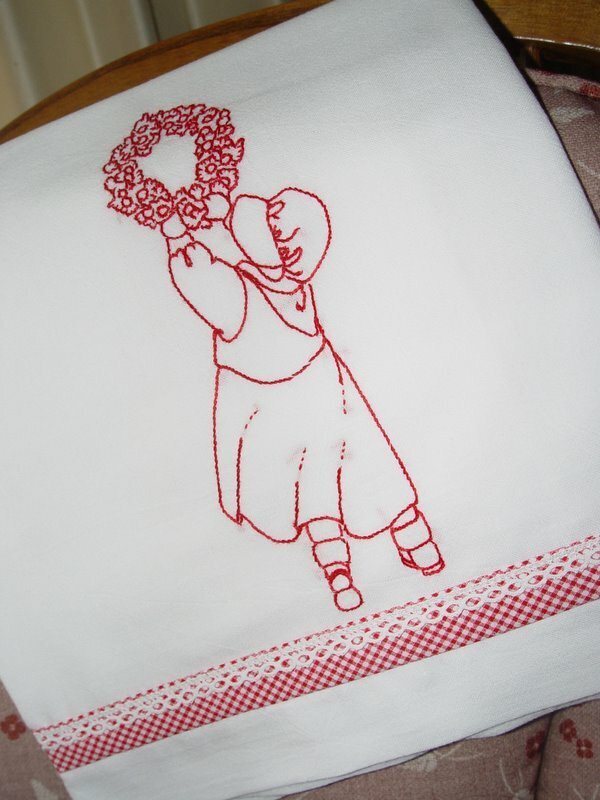 But, recently I tried my hand at redwork and have enjoyed both the process and the cheerful finished sampler. The redwork tea towel in the picture above is one I recently embroidered for a friend in the tea towel exchange group I belong to. Originally, red dyed cotton threads were not colorfast and the colors tended to bleed when they became wet. Embroiderers tended to select other colors or stitch red's in silk threads that would not bleed. Then a red dye was developed in Turkey that did not bleed or fade when washed. Soon, Turkey red thread became a reliable and popular choice for stitching decorative patterns on household items. In 1876 The Royal School of Art Needlework from Kensington, England produced a booth at the Centennial Exposition in Philadelphia. American women were charmed by the intricate embroidery and were ready to try their hand at it. It soon gained popularity, as more and more stitchers created embroidered samplers and quilts using this process. Redwork designs range from very simple to elaborate and intricate. Over time, pictures of nursery rhymes, people, buildings, animals, and flowers have been depicted in this art. In times past, squares of preprinted patterns were made available for redwork. These squares cost a penny apiece, thus the name penny squares became a common term when describing these blocks. Completed blocks were used for many household projects, but became especially useful and popular for bedcoverings. Blocks were sewn together and a feather stitch or cross-stitch was used to cover the seam line. Stitches especially common when stitching redwork are backstitch, outline stitch, and the stem stitch. The stem stitch is also called the South Kensington stitch or the English Kensington stitch, a name that probably took hold because of the popularizing of this embroidery style by The Royal School of Art Needlework in 1876. I love redwork. Thanks for the history behind it. Beautiful! Where do you get patterns for this? I used to cross stitch, do you use the same kind of thread that you would use for that? Nice research on a charming craft. How interesting! I didn't know why redwork was also called Turkey work. This explains a few gaps in my understanding. Beautiful tea towel you've created, too. Very charming indeed. I love the look of Redwork...and have also seen *blue work*....green work...etc....I love your design...and the way you trimmed your towel....your recipient will be blessed ! I always wondered why the older country ladies called redwork 'turkey work'. I always assumed it was because the feathered stitches looked like turkey scratches. I don't that these ladies knew why it was called turkey work either. Having reduced eyesight due to something they call 'old age', I now do my redwork on an embroidery machine. Perhaps not as satisfying, but it looks a lot better than when I do it by hand! a vintage transfer of a smiling teacup !